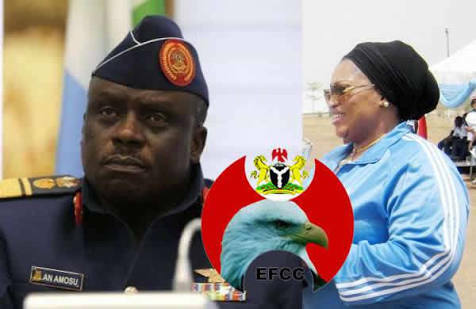 The Economic and Financial Crimes Commission said on Tuesday it had recovered N2.4bn and $115,000 from a former Chief of Air Staff, Air Marshal Adesola Amosu, who is being tried for an alleged fraud of N22.8bn. An investigator with the anti-graft agency, Tosin Owobo, told the Federal High Court in Lagos on Tuesday that the agency recovered the $115,000 in cash from Amosu’s house. The N2.4bn, Owobo said, was recovered as bank draft, while the anti-graft agency also recovered N383m from his wife. Owobo appeared as a prosecution witness before Justice Mohammed Idris, who is presiding over the trial of Amosu and 10 others. Those standing trial with Amosu are Air Vice Marshal Jacob Adigun and Air Commodore Gbadebo Olugbenga. Joined with them in the charges are eight companies, which they allegedly used to siphon the N22.8bn from the coffers of the Nigerian Air Force. The companies are Delfina Oil and Gas Limited, McAllan Oil and Gas Limited, Hebron Housing and Properties Company Limited, Trapezites BDC, and Fonds and Pricey Limited. Led in evidence by the prosecutor, Rotimi Oyedepo, Owobo added, “About N100m was recovered from the third defendant, Air Commodore Gbadebo. “Funds were also left over in the St. Solomon’s UBA account, recovered through the first defendant’s wife. Owobo listed the recovered vehicles to include a bulletproof Lexus LX 570, a bulletproof Landcruiser Sports Utility Vehicle and a Toyota Avalon. Justice Idris adjourned further proceedings in the case till April 18.